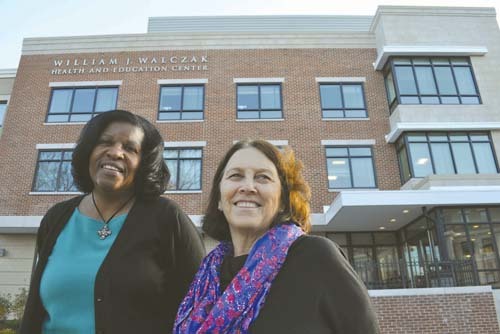 The William J. Walczak Education and Health Center — named for the founder of the Codman Square Health Center — is open for business – and classes. An official grand opening is on hold pending the return to action of the only other living Bostonian who gets his name on big new buildings these days – Mayor Thomas Menino – but the building itself has been in partial use since September and is due to be fully up and running by year’s end. The 34,000-square-foot addition to the existing Codman Square campus is a shared facility and a shared triumph. The two lower floors are largely the preserve of the Codman Academy Charter Public School , a 145-student high school that was spawned by the health center 12 years ago. The top floors of the Walczak wing are now coming into full use by the health center itself, which is relocating exam rooms and office space for physicians into the top levels. The school and the health center share certain common spaces, including a first-of-its-kind (in Dorchester) black box theater, a dining area, and outdoor garden space.